Bustling Atlanta and leafy Savannah might get more buzz, but it's worth getting to know the wilder, quieter charms of Georgia's Atlantic coast. 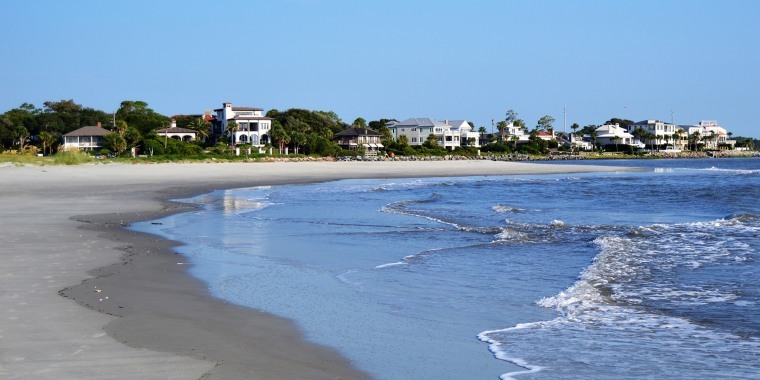 St. Simons is part of the appropriately named Golden Isles, a quartet of barrier islands that also includes Little St. Simons Island, Sea Island and Jekyll Island. To get a fun, effortless overview of the island, book a 90-minute Lighthouse Trolley tour for your first morning. (Note that the guests on the afternoon tour ride in an air-conditioned van due to the heat.) You'll stop at sites like the restored, one-room Harrington School House, now a museum focused on both preserving and educating visitors about Gullah-Geechee culture. Another stop, the castle-like Fort Frederica, was the site of a key battle between England and Spain in 1742, but kids will appreciate the rampart ruins, cannons and impressive water views. The condominium suites at the Sea Gate Inn are managed by the Sea Palms Resort, so guests get perks like concierge and daily housekeeping services, but have a kitchen and separate master bedroom so their quarters feel more like home. There's also a lovely pool in the center courtyard, although given the primo location across from the beach, you may not even make it there. Want to put yourselves in the center of the action? Book a stay at the lemon-yellow St. Simons Inn by the Lighthouse. As the name suggests, you'll be close to the maritime beacon, as well as other must-sees like the Neptune Park Fun Zone pool and the fishing pier. The rooms are all cozy and no two are alike—you'll feel like you're staying with friends who just happen to have the best address in town. The fact that it's housed in a former gas station is enough to make one curious about Southern Soul Barbeque. But as the dozens of foodie accolades attest — Southern Living has named it the South's Best Barbecue Joint — this place has major smoked-meat cred. Kids hoover up the mac and cheese, hush puppies and fried Oreos, while their parents will come home dreaming about the pulled pork and smoked chicken, and creative interpretations like jerk ribs and brisket cheesesteak. At Palmer's Village Cafe, one of the island's most beloved breakfast spots, you can fuel yourselves for a day of splashing in the waves. There are seven signature omelets, including the Chix Pot Pie, made with creamy chicken and crumbled biscuits, as well as carb-heavy favorites like challah french toast with bacon and maple glaze.